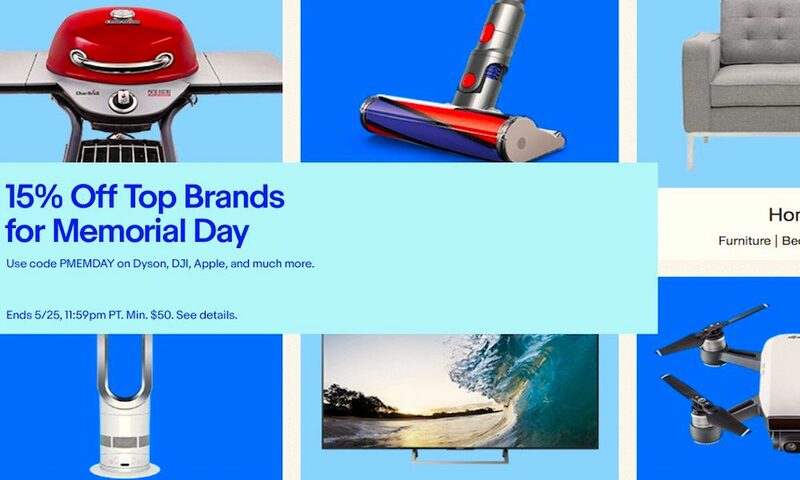 eBay is now offering a 15 percent discount on a slew of tech products, thanks to a new sale ahead of the long Memorial Day weekend. The 15 percent bonus discount is available on all orders over $50, with a maximum discount capped at $50. It’s available by inputting the coupon code PMEMDAY during checkout. The coupon code is good through 11:59 p.m. PST on Friday, May 25. You’ll find tons of technology products from industry heavy-hitters, including Apple. It’s a great time to browse eBay — especially if you’re already in the market for a new Apple product. In most cases, you’ll be able to save a pretty penny on something you were going to buy, anyway. Here are some of our topics, with the included after-coupon price at the time of writing. Though, because it’s eBay, the prices are variable. Also, you should note that quantities are limited for some of these items. You’ll also find other top-selling brands, including Dyson appliances, DJI drones, cameras by various DSLR manufacturers, and various smart TVs. The best way to find the products you want is to peruse the sale, but here are some ideas to get you started. The discount covers the total purchase price, excluding shipping or taxes. The coupons can only be used once within a single cart transaction. Again, the promotion expires midnight this Friday. Also note that it only applies to certain sellers, so go to this pageand be sure to type your query into the Search this sale bar.